We featured this majestic winter wonderland in December, but it was so nice we just HAD to feature it again! Directions: From Lolo, drive 33.7 miles to Lolo Pass, which is on the border of Montana and Idaho and well-marked with signs. The visitor center is technically in Idaho and the time changes one hour back here. What to expect: Packer Meadows is a historical spot visited by Lewis and Clark in 1805 on their journey to the Pacific Ocean. 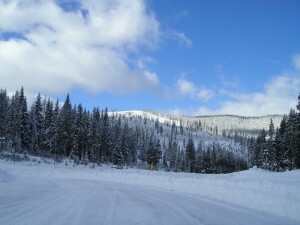 It is located at Lolo Pass on the border of Montana and Idaho. There are two wonderful ski loops here – Glade Creek Loop and Packer Meadows Loop, which is the longer of the two. The cross-country ski trail is groomed and located next to the Visitor Center. Put on your skis here. Follow the sign for the skier through the woods for about a quarter mile. Cross the Forest Service road and continue on following the well-marked trail. The first part of the trail is on the north end of the Glade Creek Loop. After a half-mile you will cross Forest Service Road 373A and will be officially on the Packer Meadow Loop. After another 0.5 mile, you will cross Elk Meadows Road 373. This road is used by snowmobilers, so be careful crossing it. Go another 0.5 mile and cross Road 373 again. From this point on, you will not cross any paths with snowmobiles. There are lots of maps of the ski and snowmobile loops posted at junctions so utilize those if you forget a map. Tip: Before you put on your skis, don’t forget to pay the $5 recreation fee and check out the recently renovated visitor center, which has a small museum, a gift shop with lots of books; and hot coffee, tea and cocoa. Grab a map of the trails too. Hours and days of the visitor center vary depending on the season.